You might have already downloaded LightArrow Organizer for free and you’re just now getting familiar with it or you’re thinking about giving the app a test drive. This post is geared towards helping you get to know LightArrow Organizer’s all-in-one power. 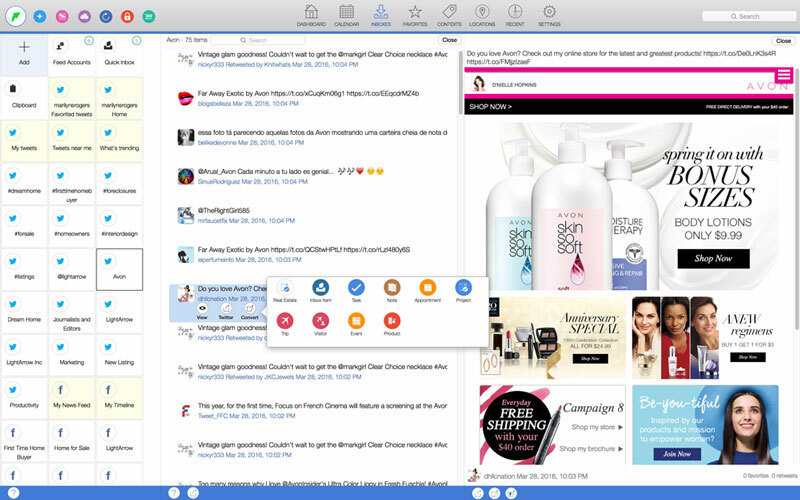 Using LightArrow Organizer is a fantastic way to organize your life. It’s free to download and it revolutionizes business and personal productivity. 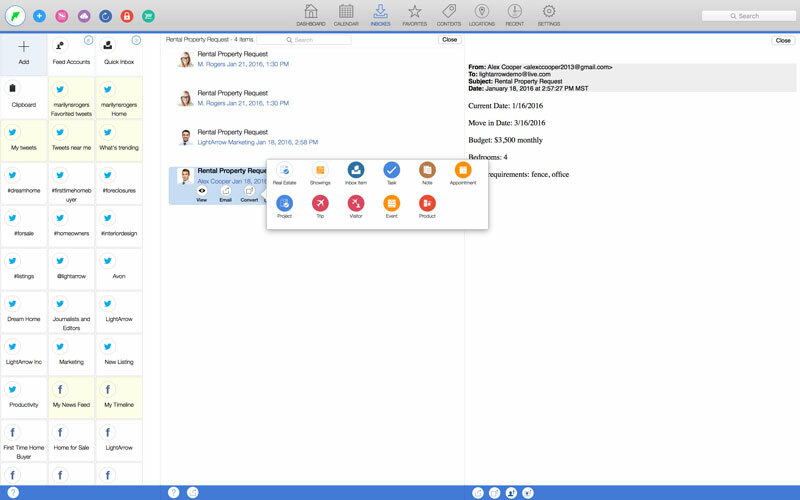 The app provides powerful calendars, contacts, information harvesting from email inboxes and other data sources, project and task management, and organization of all related information in a single app. LightArrow Organizer’s all-in-one power is evident through the Dashboard. This Dashboard centralizes visibility to enable you to easily focus and act on what matters in your busy work and life. If you’re a new user, you’re presented with the Dashboard from the get-go. The dashboard’s purpose is to provide an organized view of everything that’s important in your work and life. The Dashboard is separated among cards. These cards focus primarily on Contacts, Calendars, Projects, Digital Content, and supporting information. You can pin items, views, contexts and categories to these cards so they are relevant to the things that you do, thus you’re able to quickly access important items. There are several things that are important in work and life and the “Quick Add,” which is available in LightArrow Organizer’s Dashboard view lets you add all of them. 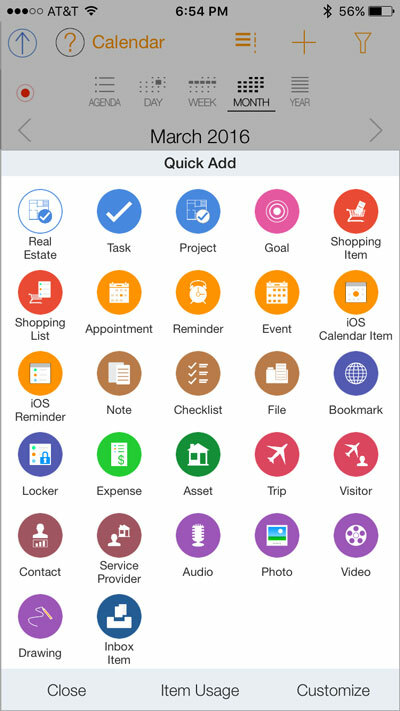 The many different types of items that are available through the Quick Add (plus) button are Tasks, Projects, Goals, Shopping Items, Shopping Lists, Appointments, Reminders, Events, iOS Calendar Items, iOS Reminders, Notes, Checklists, Files, Bookmarks, Lockers, Expenses, Assets, Trips, Visitors, Contacts, Service Providers, Audio, Photos, Videos, Drawings and Inbox items. However, you can customize Quick Add to include more items that you frequently use. You can easily customize the Dashboard by pinning items and modifying Quick Add as shown in the short video below. Many of us are inundated with information from many sources including email, social media, and the web. Most likely, you’re hopping between Twitter, Email, your Evernote online notes and the web to keep up with all of this information. LightArrow’s Inboxes is designed to be a single source for viewing and harvesting information from all of these channels. Furthermore, you can filter this information so you can find data that’s important for you or your business by saving common searches with keywords, timeframes, and account names (people). As you discover and harvest information from multiple sources, you can make this information actionable. For example, your supervisor might request that you create a report via email or you might find a webinar mentioned on Twitter that you want to attend. You can convert these actionable items from web, email, or social channels into items you can take action on such as: tasks, notes, events, projects, trips, visitors, or products. For example, you can convert the webinar invitation found on Twitter into an event in just a few simple taps – no app switching is required. The Inboxes view also provides basic email and social media functionality, such as viewing, configuring, and deleting of the messages in your channels. In addition, the app makes contact management easy by allowing you to add email senders and recipients from email messages that you receive to your contacts and contact groups in a few simple taps. It’s also important to note that you can save attachments to your online folders (such as Dropbox) or to your local folders from this view. Social media functions are also available, such as interacting with your friends and followers. If you follow the Getting Things Done® (GTD®) method, an inbox is “simply the place where all the incoming things land.” The ability to record your ideas easily in a reliable system for later analysis represents the “Collection Phase” of the GTD methodology. Inboxes assists you in your implementation of the inbox in the GTD method. 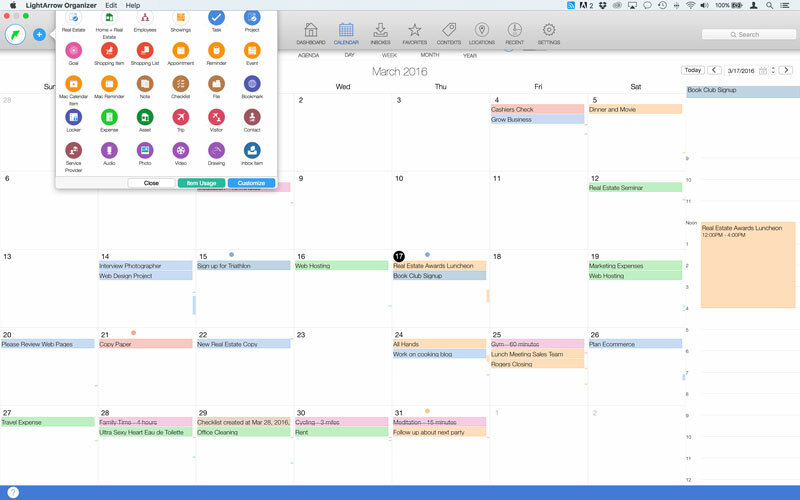 Typically, calendar software and apps allow you to create events or appointments, but they leave you wanting more. When you have projects, tasks, reminders and other information stored in your apps, you’re required to shift from app to app to find those types of items — which wastes your time. LightArrow Organizer makes you more efficient and organized by giving you the ability to add a variety of types of items to your calendar so you never miss a beat. Below is an example of the Month view in LightArrow Organizer calendar. Notice the different types of items you can add in the Quick Add menu. It’s never fun to switch back and forth from different calendars. Like I said before, you’re more productive when everything is in one app. That’s why our calendars work with the calendars that your iOS device supports. A common question from our users is how our calendars work with Google Calendars. 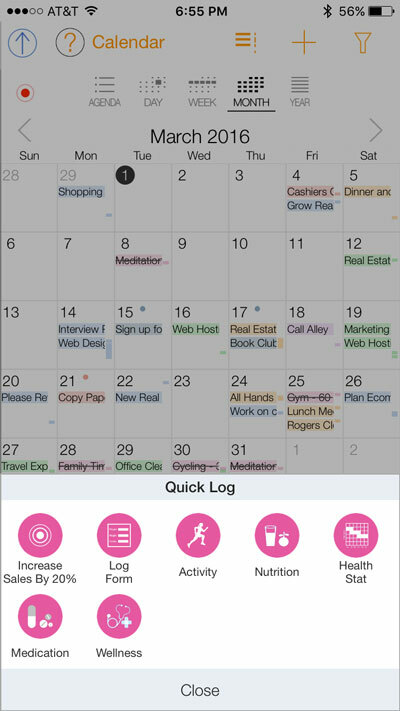 LightArrow Organizer does not directly sync with Google calendar, but we let you view, create, and edit and them directly from within our app’s Agenda and various Calendar views (Day, Week, Month, Year). If your Google account is included in the iOS Calendar app, all its items (and other iOS Calendar items) are included along with all the items created in our app in the views. You can find the Google instructions here: Setup Google Sync With Your iOS Device. If the Google calendar is writable (not readonly) and you set it as the default calendar in our app then items (such as tasks, projects, reminders, event, etc.) created in our app will result in a corresponding calendar event being added to the Google calendar (via the iOS Calendar app). These items in our app and their corresponding linked events in the Google calendar will be sync via the iOS Calendar app. 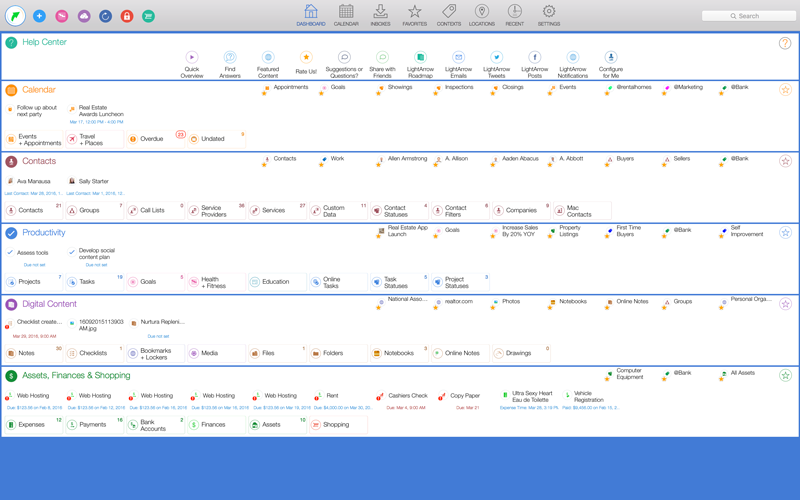 The Agenda/Calendar views in our apps give you a complete picture of all items in our app – including items natively in our app (tasks, appointments, projects, trips etc.) as well as items from your iOS Calendar and iOS Reminders apps. We also allow you to convert your iOS Calendar items (including Google ones) from our Agenda and Calendar views into other types within the app such as tasks, appointments, trips, etc. Our Search view, in addition to searching through items in our app, also has the ability to search and locate events in your iOS Calendar in the next 30 days. Items within the app are available for reuse throughout the app. Device-to-device sync is available across Mac and iOS. Best-in-class integrations allow you to work with your favorite apps. Through the power of integration, items in LightArrow Organizer are intelligently connected. For example, your shopping information is available from other items, such as the items you need to buy for any events you are planning automatically show up in your Shopping lists. The result is much better organized views of everything you buy, need to buy, or had bought for you and where you shop. 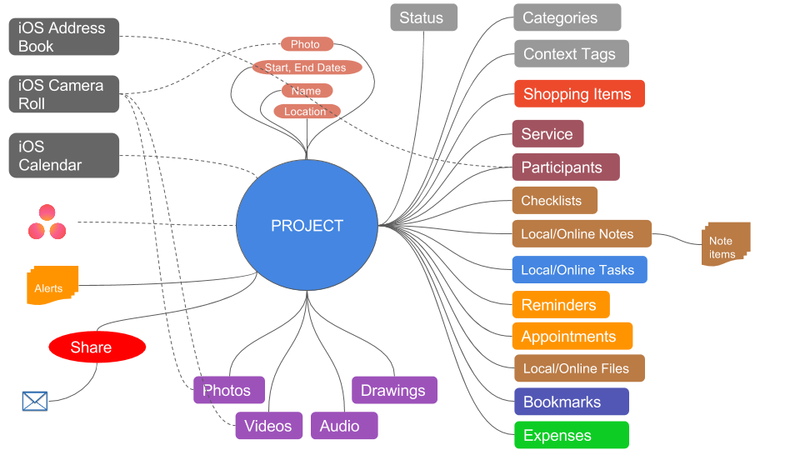 Notice in the following diagram how a project is connected to many different types of information within the app, which allows you to easily find the information when you need it. We believe that productivity tools should never sit on their own little islands. That’s why we make it easy to access your online documents, notes and tasks from Google Docs, Asana™, Evernote®, Toodledo®, Dropbox™, Box™ and OneDrive™ (SkyDrive).